We are a local affiliate of the Cactus and Succulent Society of America (CSSA) with members from Washington, DC, Virginia and Maryland. For more information about the CSSA see their web site http://www.cssainc.org. to operate as a non-profit entity. Share ideas and techniques with other cactus and succulent growers. Use of an extensive club library. A monthly newsletter, The Eastern Spine. Sales table with members plants and related items. Monthly raffle of donated plants and related items. Annual Cactus & Succulent Show & Sale. Holiday Buffet at St. Anselm's Abbey School in December. The NCCSS membership is now based on a two-year cycle. Individual membership is $20.00 and family membership is $30.00. These dues will cover a two year period for this year and next year. The Eastern Spine is published monthly and is included with your membership. Bob Stewart is our newsletter editor. Join our club and get your own copy delivered to your mailbox. Click here for an on-line copy of the membership form. Regular meetings are held at St. Anselm's Abbey School (at the rear of the Abbey grounds) located on South Dakota avenue at 14th street, NE, Washington, DC. Meetings are held on the third Sunday of each month, September through June. There are no regular meetings for July and August and the times and dates of the summer events will be announced in the club newsletter. General meetings begin at 10:30 am and typically end by 12:00 noon. Board meetings for club business are open to all members and begin at 9:30 am. Refreshments will be provided. Come join us! Our program committee arranges for us to have a unique event each and every month. These consist of lectures, slide shows, informal discussions and presentations; they are always interesting and informative. 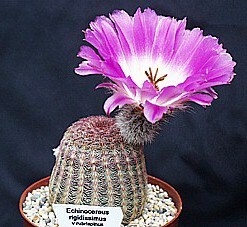 A different genus in the Cactaceae and a genus in another family with succulent plants is featured at every meeting.. Members bring in representatives for show and tell, swap, trade or gift. If you have any favorite plants other than the plant of the month you want to brag about, feel free to bring them to the meetings. Amaze us! Each month, members bring in their surplus plants and other items of interest to the meeting and each attending club member is given three free raffle tickets for them to select from the various items for something they can take home. If you have any surplus plants, seeds, pots, books or any other plant related items you want to sell, you can bring them to the meeting. Set your own price. 25% goes to the club to buy new books and cover other club related expenses. 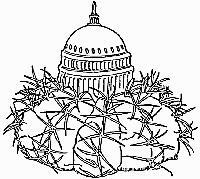 Thank you goes out to all who helped to make the 14th Eastern Cactus and Succulent Conference and the Annual National Capital Cactus & Succulent (NCCSS) Show for 2003 a success. The plant show report and the complete list of show winners are on this page. Each August we meet at a member's home for food and fun.